The ASUS VN279QL 27" 178� Ultra Wide Ergonomic Monitor is an ideal display unit for both office and home. 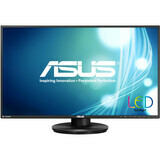 The 27" Widescreen LED Display has a dynamic contrast of 100000000:1 for crystal clear visuals. It has a full HD resolution of 1920x1080 pixels in 16:9 aspect ratio. There is an HDMI port for connection along with built in stereo speakers for a dynamic sound output. Order the ASUS VN279QL 27" 178� Ultra Wide Ergonomic Monitor today!